In the West, relatively little is heard about Saudi Arabia’s involvement in Middle Eastern politics. Until a Saudi judge hands down a sentence for an offense of Kingdom law which attracts attention from international human rights groups, most American media pay little attention to how the Kingdom operates. On the rare occasion when coverage is given, it is presented from a viewpoint which is perhaps best described as neo-Orientalist, and no attempt at understanding (a word some seem to think has the same connotation as “agreeing”, which is perhaps why it is avoided in so many instances) why the Saudis behave as such is made whatsoever. Last week I attended the Senate hearing to discuss 2011 Foreign Policy Priorities, where Secretary of State Hillary Clinton presented the State Department budget and priorities and was questioned by each of the Senators on the committee. Nothing groundbreaking occurred. The emphasis was on the threat of Iran’s nuclear program, with sprinklings of other Middle Eastern issues thrown in. “Faces on the walls – martyrs freshly emerging from life and the printing presses, a death which is a remake of itself. One martyr replacing the face of another, taking his place on the wall, until displaced by yet another or by rain.” Palestinian poet, Mahmoud Darwish, accurately captured the culture of martyrdom and the phenomenon of martyr iconography in his book Memory for Forgetfulness. He understood how these images can create a vicious cycle of violence. Martyrs exist throughout the world, but their images are increasingly used in places of crisis, and especially in the Middle East, to reflect social changes, shape society, and prolong violence. In the West Bank, Gaza, and the refugee camps in Lebanon the walls and streets are plastered with the faces of martyrs killed in the struggle against Israel. 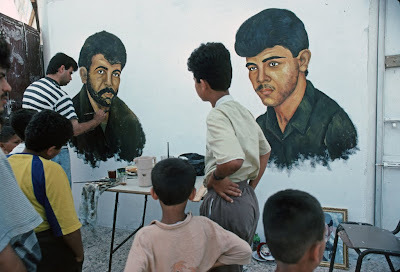 Posters, billboards, signs, and hand-painted murals with the images or names of martyrs are constant visual reminders of the struggle. On television, videos of martyrs pronouncing their last words fill the airspace. And in houses, pictures of heroic martyrs line the walls and children collect cards with the stats of martyrs, like baseball cards. Martyr iconography in these areas symbolizes the resistance struggle and the opposition to the current situation. In today’s Christmas Eve edition, the New York Times‘s editors have given nearly half a page to nuclear hawk Alan J. Kuperman to make a lengthy (and extremely misleading) argument that the U.S. should bomb nuclear facilities in Iran. Is this our Happy Christmas gift from the NYT? We have reached the point where air strikes are the only plausible option with any prospect of preventing Iran’s acquisition of nuclear weapons. Postponing military action merely provides Iran a window to expand, disperse and harden its nuclear facilities against attack. The sooner the United States takes action, the better. Kuperman takes for granted that Iran is pursuing the acquisition of nuclear weapons, though this claim has never been made by the responsible authorities at the International Atomic Energy Agency. But that is not the only way in which his article is misleading, inaccurate, and/or grossly irresponsible.